Join Splitboard Guides International on this unforgettable, once in a lifetime Horse Assisted Splitboard Trip. Come experience Volcan Puyehue 2100m and find out why this is our guides favorite trip of the season. Relax in the wonderful termas that Chile offers, sample the local cuisine and meet the friendly people that make this country so special. This is a 7 night 8 day all inclusive trip to Chile. With a mix of ruggedness and splendor this trip offers both the rustic, yet warm and quaint accommodations of the El Caulle Hut to the ever so inviting Termas Agua Calientes and its charming hospitality and relaxing hotsprings. Travel is relatively easy with an overnight flight to Santiago, Chile, followed by a short hopper flight to the city of Osorno in the heart of the Lake District, where we will be there to start your adventure with you. Your trip starts from the comfortable cabanas at Aguas Calientes near the town of Puyehue. Come relax in your own hot spring tub situated on your private deck as you prepare for your amazing journey. We begin touring the Volcano Casablanca at 1990m, this is a perfect volcano ski to start the trip off and a great way to get the legs moving again. After spending the day shredding a few laps, its time to head back to Agua Calientes for a soak, followed by and incredible Chilean meal. The next day our horse assisted adventure begins! 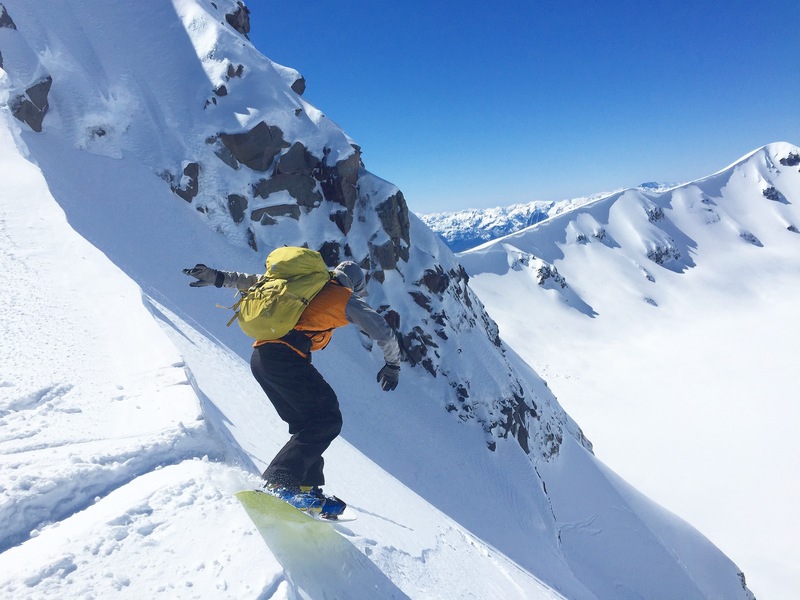 This incredible tour, starting deep in the lush jungle of Chile’s Lake District is a must do trip for the adventurous skier or snowboarder. 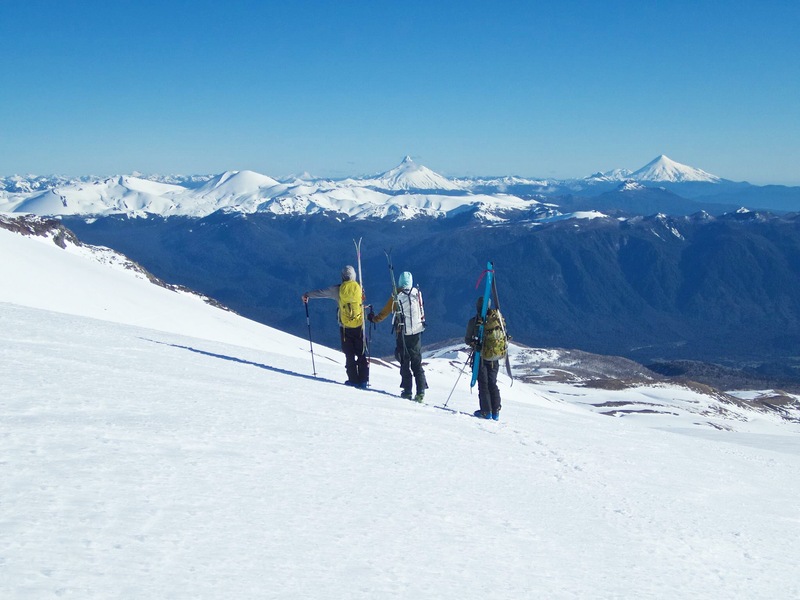 We ascend Volcan Puyehue which sits in the Parques Nacional Puyehue. 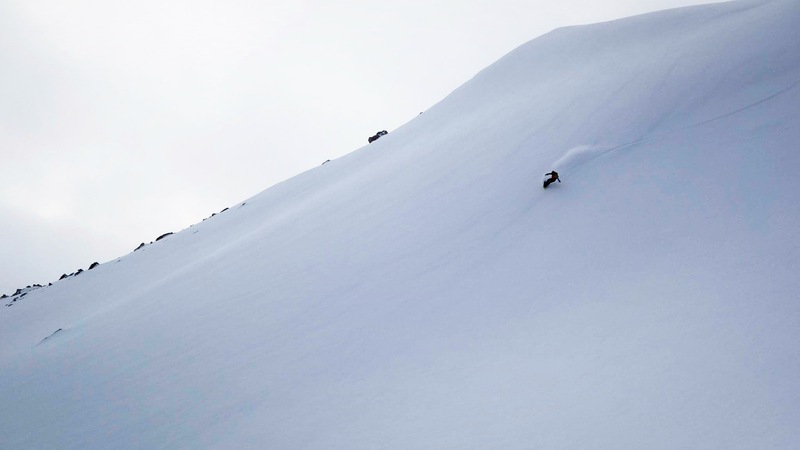 This Volcano is a hidden gem filled with incredible Alaska style faces, spine lines and an unbelievable crater you can ski into. What…… Yep thats right! With the right conditions we shred unreal steep lines into the crater only to keep the tour going inside. Up and down on a constant repeat, we climb and shred these amazing lines. Think its done, think again!! After climbing up and out of the crater rim we are greeted with the beauty of Puyehue’s North Face and the prime buttery turns it offers. Another ski down into the lava fields has us transitioning and touring back up and around to the Puyehue’s main face and 3000′ of fall line shredding right back to the El Caulle Hut for an evening of great food and stories. The next few nights are spent at the hut or in the comforts of our tents as we tour deeper into the Parque Nacional Puyehue and the endless opportunities this a place offers. The trip culminates back at Termas Agua Calientes for the last evening of soaking and sampling the fine cuisine, with transportation back to the Osorno airport the following day. SKILL & EXPERIENCE LEVEL: Advanced level skiers and snowboarders with some previous backcountry experience. For this Chilean ski tour, you should be comfortable riding black diamond runs at a resort in most any conditions. Very good physical condition is required, with the ability to ski tour 4000-6000 feet a day while carrying up to 45lbs. INCLUDES: This is an all inclusive trip that includes your lodging, hotspring fees, dinners and breakfast. Every meal is provided on the overnight hut tours too. 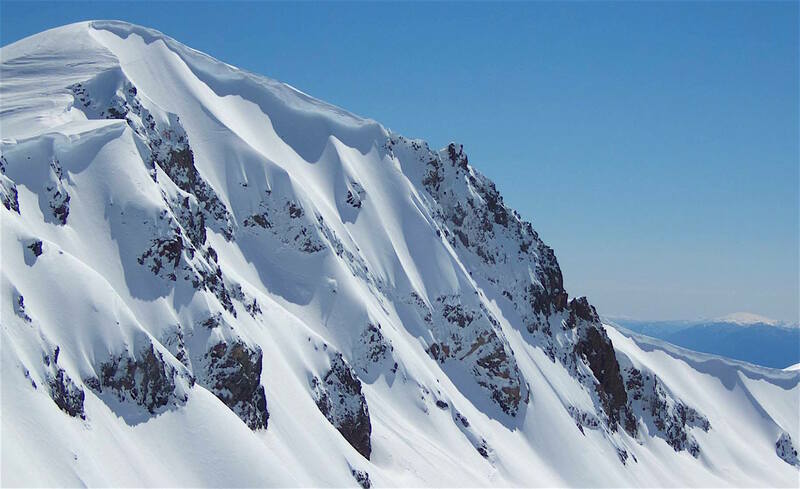 We provide only the best avalanche safety equipment along with any technical gear if needed. We are your chefs providing all the cooking in the huts. Enjoy a hot coffee or some tea and let your guide prepare your backcountry cuisine for you. 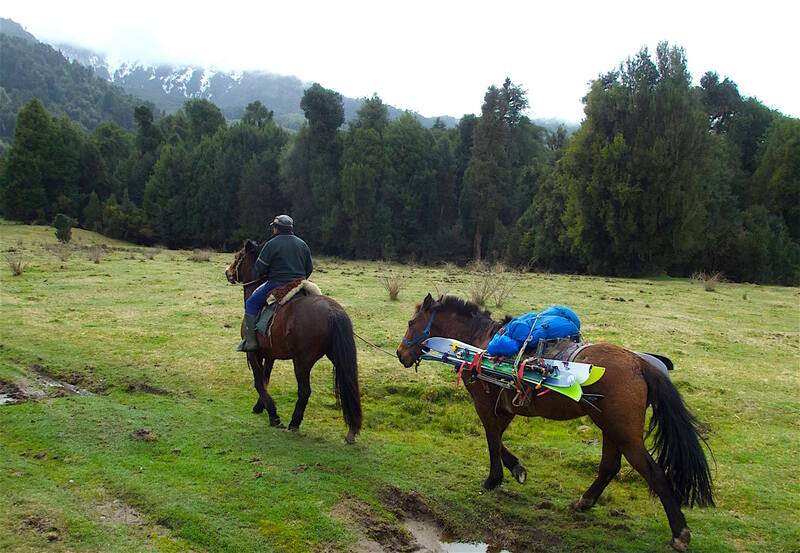 We also provide all in-country private ground transportation, mules/horses, local logistics and AMGA certified ski guides for your 8 day adventure. Maximum guiding ratio of 4:1 and need a group of 4 to run this trip with these prices. Once your trip deposit is paid, we will then begin the process of making sure everything is perfect for your adventure to Chile.